Last year's impromptu birthday celebration for Kate DiCamillo provided one of the most memorable reading experiences I have had with my daughter. I think it is quite possible that I will be remembering this week with the same clarity. We had checked out Mercy Watson books from the library twice before. Last year, for DiCamillo's birthday the books weren't even opened because we got sucked in by her novel The Miraculous Journey of Edward Tulane . Then, about two or three months ago I grabbed a few from the shelf and slid them in my daughter's library bag, but they went unnoticed and unread. This time, I checked out the whole series and the books sat on the floor of my children's room for about a week and half. Then, last Sunday I chose to read Book One, Mercy Watson to the Rescue , as my choice for a before bedtime reading and my daughter followed suit choosing Book Two, Mercy Watson Goes for a Ride . Reading these two books along with another book chosen by my son lead to the longest bedtime reading session on record. We read for over an hour before bed! 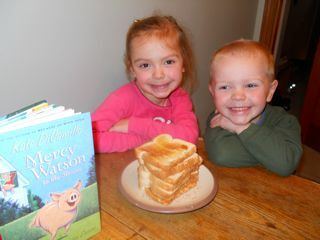 In that reading time, both of my children fell in love with the selfish, recklessly impulsive, hot-buttered toast loving pig, Mercy Watson. According to Kate DiCamillo on MercyWatson.com, "Mercy Watson had been in my head for a long time, but I couldn't figure out how to tell her story. 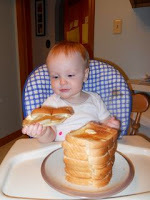 One day my friend Alison was going on and on about the many virtues of toast. As I listened to her, I could see Mercy nodding in emphatic agreement. Sometimes you don't truly understand a character until you know what she loves above all else." Not only does Mercy Watson love toast, but so do my children. I have been serving it for breakfast all week. I ask, "What would you like for breakfast?" My daughter replies, "Two pieces of hot buttered toast with a great deal of butter, please." 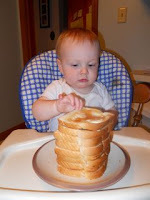 My son replies, "Hot buttered toast." I ask for clarification, "How many pieces?" He says, "Six..or ten." Kate DiCamillo also spoke of Mr. and Mrs. Watson's unwavering love for their porcine wonder, Mercy, and the series, "They continue to see her in the best possible light. I've come to believe that that is what love is all about: somebody insisting, mercifully, on seeing us as better than we truly are. So these books, meant to celebrate the absurdity of life, also celebrate the amazing blessing of love." In each book, there is an "absurd life" event for Mercy. My daughter's favorite was Mercy's assault on bottomless buckets of buttered popcorn at a drive-in movie and my son loved the frequent appearances that were necessary by Ned and Lorenzo, the local firefighters. Kate DiCamillo closed her comments on Mercywatson.com by asking, "Will you be able to find room in your heart for a little love? A not-so-little pig? Will you be a friend to Mercy? I hope so." We certainly found a friend in Mercy. These books will be memorable for a long time. Thank you so much Kate for writing books that have had such a positive impact on my family. I often include video interviews in many of my posts. They help give me a perspective for the week. They allow me to tell little stories about the author to my children when we are reading the books. An informal interview of Kate DiCamillo and her writing process conducted by Jenny Brown is one of my favorites. This video provides a glimpse into a typical day of writing for DiCamillo. I ran across the video above last year when I was first learning about Kate DiCamillo. This year I found another great interview, but great for a different reason. The video below is much longer, about 30 minutes, and it is much more formal. However, the questions asked by Stacey Cochran allow Kate to open up about the journey she has had becoming the author that she is today. My favorite birthday memory. Hmmm...in the fifth grade, for my birthday, I had a slumber party to end all slumber parties. We (six of us) stayed up all night. We put on my mother's "shoes of her youth" and danced to all her Arthur Murray Dance records. It was grand. Birthdays now involve scrabble games and cheesecakes made with honey and good, good friends. 8. Happy Birthday Author 2010 - How we discovered Kate DiCamillo? 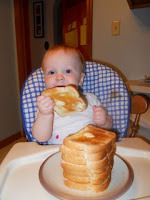 Who wants toast? WE DO! I love Kate DiCamillo's books! My favorite is The Miraculous Journey of Edward Tulane. There's just something magical about it. My daughter likes the Mercy Watson books. I like the picture of your daughter with all of that toast! Too funny! Too much fun!!!! I love Mercy Watson! I'm reading excerpts from Kate's novels with one of my 3rd grade students right now. I'm going to see her tomorrow so we'll have to sing Happy Birthday to Kate DiCamillo! 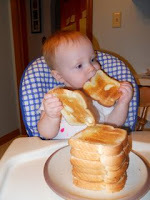 :) AND, toast is easy, I can so do toast tomorrow for my own kiddo! I had to read Bink & Gollie at least four times today. We'll probably be posting a review this weekend--will have to link to this post. WOW! Thanks for all the comments! @Sherry - We love Edward too! @Mrs. Vincent - Would love to her about your visit with Kate! @LitLass - We read Bink and Gollie too. Thanks for the link. I haven't read the Mercy Watson books -- obviously they need to go on my list! I loved Despereaux, and Because of Winn-Dixie. Happy birthday, Kate DiCamillo! Thank you for the wonderful books!